Video stability is one of the key differences between professional and amateur video, and the GoPro camera is an admirable bridge between the two. The exceptional clarity, versatility, and optical performance of the GoPro make it the camera of choice for filmmakers, especially when shooting in tight spaces where bulky equipment can hinder the perfect shot. Whether you are professional or on vacation, jittery video can be a strain to watch. 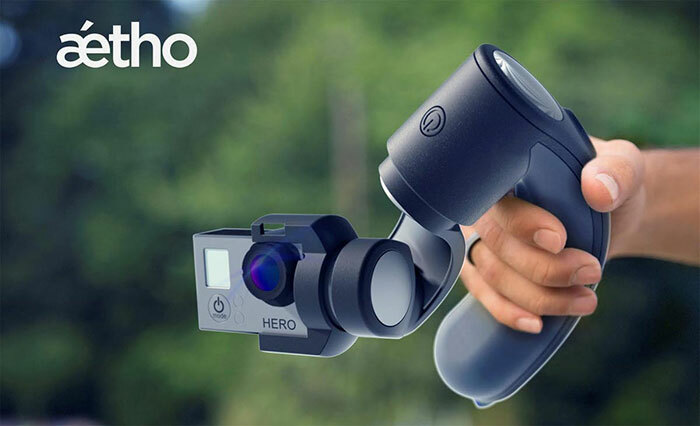 The Aetho Aeon GoPro handheld stabilizer is the perfect answer to shooting in active spaces—while running, jumping or even paragliding. The Aetho Aeon features a tri-axis accelerometer that is powered by a sensor that records over 1000 measurements per second. The triple-axis brushless motor is housed in a durable, yet lightweight injection molded ABS plastic body. With a total span of nearly 8m square inches, the Aetho Aeon is large enough to provide a strong grip and weighs just 500 grams. Inside, the stabilizer features a 32-bit processor and a USB-charged battery with 5 hours of operating time. The on-board LCD display allows you to monitor your video in real time as you move. The built-in joystick offers tilt and pan control over the camera. The stabilizer is designed and has been tested for use in extreme action environments including skateboarding, contact sports, running, and motorsport.